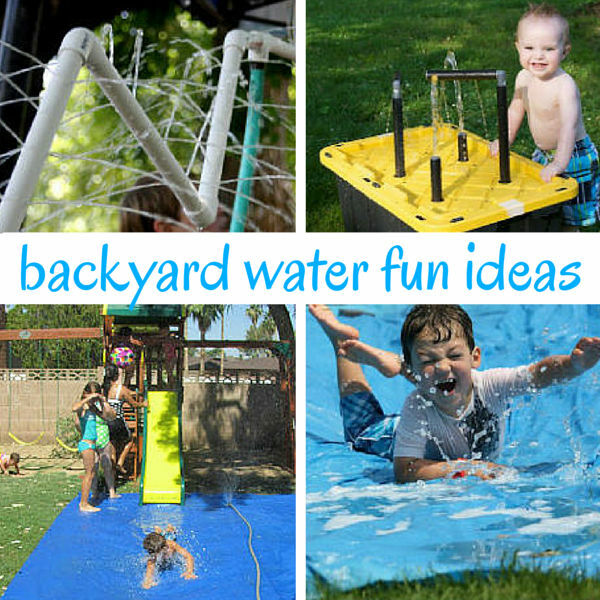 Looking to have the best backyard water play ideas in your very own yard this summer? You have come to the right place! We rounded up the very best water fun ideas we could find and gathered them together here – just for you! Get ready to get wet, cool off, learn something new and enjoy your summer with your kids. Oh and, if the neighbors are jealous because you have the coolest backyard in the neighborhood, you can place the blame on me! Water play is always fun but it is perfect when the weather is sweltering and the kids are getting antsy. When you break out the water, all will suddenly be well with the world. <<< Amazingly true! Grab a few ideas here and be sure to share your best backyard water play ideas in the comments. We would enjoy hearing what you do to have fun with water. One little sprinkler, a tarp and a slide are all you need for this fun water activity. You know your kids are going to do this one for ages! This a wonderful family project. Build it together! This unique water table is perfect for younger kids. I love that the water shoots up and squirts down. There are so many learning opportunities here. Give them some ping pong balls, things to catch the water, a sieve, a shovel and more and let them play and learn. Make this pvc pipe water sprinkler which is perfect for a hot summer day of play. They have a pretty cool water play setup . With this super simple to set up water slip and slide play idea everyone can get wet and have fun on the next hot day. No real planning ahead with this backyard water play idea. Gotta love that. 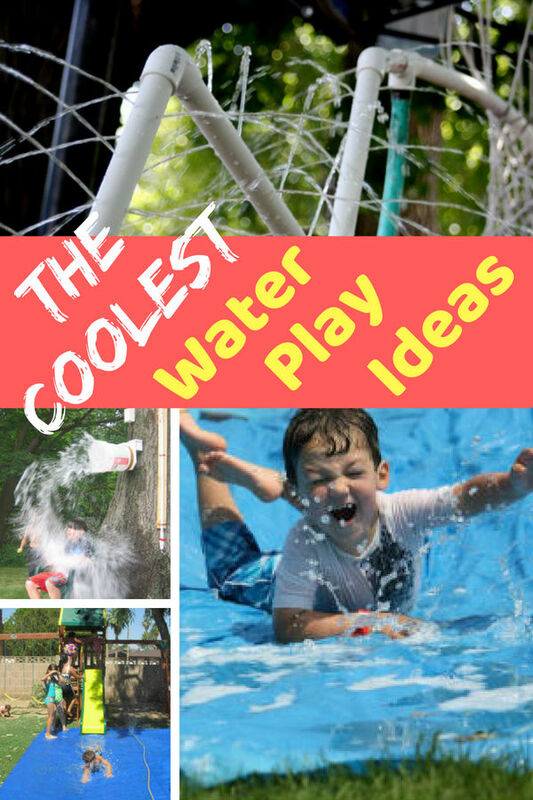 Need Cool Stuff for Your Backyard Water Play? See 50+ Ideas Here! How about a water balloon launcher that goes 200 yards! Set up some targets and shoot water balloons at it. Be sure to save some water balloons for a good old-fashioned water balloon fight afterwards. note: This idea is likely best for older kids. I have broken many balloons when attaching them to the sink or had them slip off the faucet and make a mess. This thing is great for moms like me who have to fill more than their share of water balloons. Apparently you can never have too many water balloons! Take aim and get ready to get seriously soaked! Soaked is how whoever ends up under this bucket is going to be. This is a fun one for sure. Check out the dunk bucket. Ok, this is totally cool. 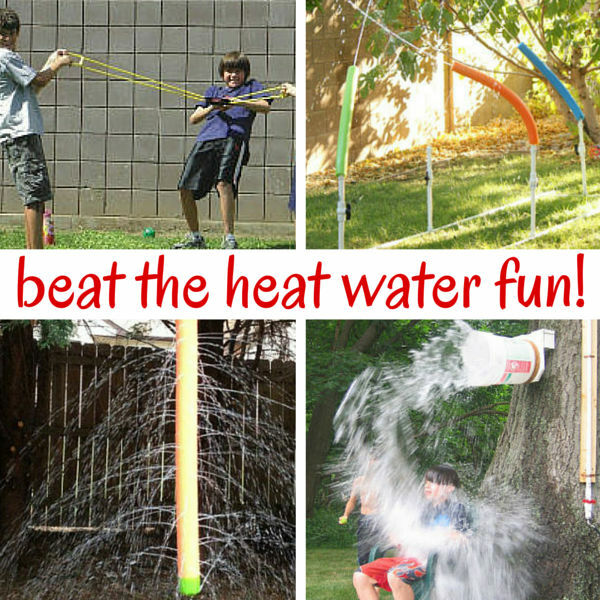 Make this pvc pipe unit and your kids will have so much fun shooting water at each other and running through it. It is like having a mini version of the water park blasters right in your own backyard. The Nerf Super Soaker Freezefire Blaster will get you soaked to the bone. Ask me how I know! We love these super soaker guns. They have held up really well and they hold a decent amount of water so you don’t have to refill your gun after just a few squirts. We play water gun tag, shoot at targets, blast cups off tables, and shoot balls with water to move them around the yard. Oh, and yes, we also get super soaked and laugh a lot. Fun! There are plenty of DIY ideas as well as some totally awesome water toys that you simply can’t miss. You and your kids will have a wonderful time this summer with these backyard water play ideas. They are a total blast! For more fun water ideas try out our posts with 50+ ideas for backyard water fun without a pool, water science experiments, and backyard water games! Epic ideas! 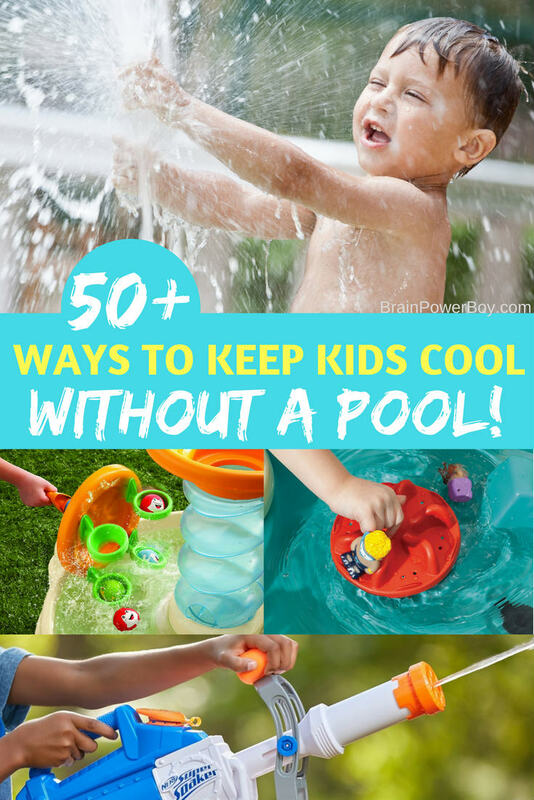 Our summer is pretty much all about backyard water play so these ideas will come in handy to mix it up a bit! Always nice to hear from you. Thanks for the nice comment. I would imagine you have a lot of great backyard ideas too!